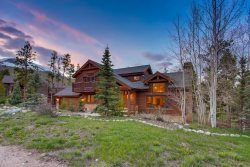 Located just above Silverthorne is a quiet town called Wildernest where this stunning 3 story home will allow you to soak in all of the gorgeous Colorado mountain views. Among the 3 stories, you will find 4 bedroom and 4 bathrooms perfect for a small group or family. Step onto one of you 3 decks to enjoy the expansive views of endless mountains, Keystone Resort and Lake Dillon. A great way to begin and end your day is by taking advantage of the outdoor table set and grill on the top deck, enjoy the sounds of nature and allow the grill master of the group to do what they do best! The home has amazing furnishings throughout the 3 levels creating privacy for all. It sits on a large private lot with hiking trails and a small brook right out the door. On the top floor are the living room, gorgeous gourmet kitchen, a dining room that seats 8, bar with bar stools, a full bath and a sofa sleeper. Down a level is the Master bedroom with its own sitting room with a loveseat fold out for a single person and a full ensuite bathroom. In the sitting room, you will find a gas fireplace, flat screen TV and a private deck. Across the hall is the second bedroom with a Queen bed and a private bath. Down on the first level is the 3rd bedroom with a Queen and flat screen TV. A little down the hallway is bedroom 4 with a double bed and single bed, both bedrooms share a full bathroom on this level. The large flagstone patio off the first level gives a great space to leave outdoor items like sleds and ski equipment. Stepping out your front door you can walk 5 minutes to the Mesa Cortina Trailhead for gorgeous hikes in the summer. The drive down into Silverthorne takes no time at all and gives you full access to all Summit County has to offer, shopping, eating, skiing and more!